While the term Big Data is open to varying interpretation, it is quite clear that the Volume, Velocity, and Variety (3Vs) of data have impacted every aspect of computational science and its applications. The volume of data is increasing at a phenomenal rate and a majority of it is unstructured. 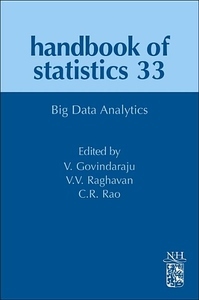 With big data, the volume is so large that processing it using traditional database and software techniques is difficult, if not impossible. The drivers are the ubiquitous sensors, devices, social networks and the all-pervasive web. Scientists are increasingly looking to derive insights from the massive quantity of data to create new knowledge. In common usage, Big Data has come to refer simply to the use of predictive analytics or other certain advanced methods to extract value from data, without any required magnitude thereon. Challenges include analysis, capture, curation, search, sharing, storage, transfer, visualization, and information privacy. While there are challenges, there are huge opportunities emerging in the fields of Machine Learning, Data Mining, Statistics, Human-Computer Interfaces and Distributed Systems to address ways to analyze and reason with this data. The edited volume focuses on the challenges and opportunities posed by "Big Data" in a variety of domains and how statistical techniques and innovative algorithms can help glean insights and accelerate discovery. Big data has the potential to help companies improve operations and make faster, more intelligent decisions.